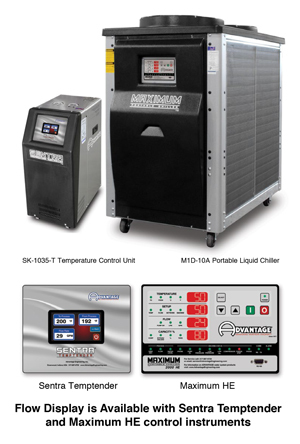 Proper heat transfer between cooling water and your mold is the key to greater profits with short cycle times and good part quality. Optimum heat transfer occurs when turbulent water flow is produced in the mold. The water flow rate must be known to predict turbulent flow within a mold. Without knowing the water flow rate you can only guess whether you are achieving turbulent water flow and the best heat transfer rates. The next time you specify heat transfer equipment for your molding operation... ask your vendor for a water flow rate indicator built into the equipment. In addition to assuring that you are achieving the best heat transfer rates as possible in your mold, here are 7 other reasons to “know your flow”. Ensures piping and manifolding are optimized. Many are surprised that even minor changes in plumbing can increase flow to the mold and decrease cycle times. Protects from buying too much pump on your mold temperature control units. Larger pumps are no guarantee of adequate flow, if the geometry of the piping, manifold and mold will not allow. The average cost of upgrading from 3/4 to 3 hp is $300. If your shop has 15 presses and 30 controllers, the added cost is $9000. Is the added expense necessary if the 3/4 hp pump is adequate? Discovers fouled lines in mold passages. Watching the flow decrease over time is usually caused by scale and debris build up (fouling) in the mold passages. A prominently displayed flow rate makes this obvious. Assures the pump is rotating in the proper direction. A pump running backwards degrades system performance by greatly reducing the flow and pressure and may cause pump damage. Pumps running backwards have often been the cause of expensive service calls. Takes guesswork out of future equipment purchases. Knowing the flow rate and the to and from process temperatures allows you to accurately calculate the cooling or heating requirements of the process. Comparing the calculated value to the rated capacity of your existing equipment will ensure that future equipment purchased is properly sized ... not oversized requiring added upfront capital expense or undersized leading to longer cycle times and lower production rates. Recreates minimum cycle time setup for a given tool. Changing molds frequently is simplified by keeping a record of the optimum flow rate for the mold. When the mold is installed, the flow rate that produced the highest quality parts at the minimum cycle the last time the mold was used can be dialed in quickly and easily. Would you like to Download FYI #295 to your browser?